Domestic Assault or Domestic Battery Evaluators provide the court with valuable information when working with persons convicted of domestic assault or domestic battery. The evaluation submitted to the court includes a risk assessment, identifies possible substance abuse or mental health issues, and provides recommendations to the judge in several key areas. 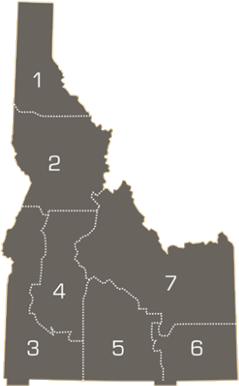 More information regarding the qualifications of an evaluator and the reports submitted to the court is located in Idaho Criminal Rule 33.3 and Idaho Court Administrative Rule 75. Please check with your local Domestic Violence Court Coordinator, DV Courts may have their own roster of Evaluators. A complete list of evaluators is available below the search options. To filter this list, please select the counties, judicial districts, or type the name of the evaluator you're searching for below, then click the "Search" button. Scroll down to see your returned results. If your county is not listed below, please select the county or counties closest to your desired location.